The gadget bods at T3.com have got an exclusive video hands-on with the INQ Chat 3G, a phone which looks primed to be the handset of choice for those with a more-than active social networking life. The INQ Chat 3G is the first phone by the company to offer up a QWERTY keyboard (improves your text life apparently) and is the most powerful handset INQ has released. On-board the phone is a HSDPA modem, a 2.4-inch QVGA TFT landscape display, a 3.2-megapixel auto focus camera, GPS and up to 4GB of storage. "The INQ Chat 3G can do a bevy of features and it does social networking fantastically well," says Rhi Morgan, from T3.com. "For those using Androids, iPhones or BlackBerrys this isn't the phone for you, but for those on a tighter budget and still want to Tweet and update your status, then for under £100 this isn't a bad deal." If you want to see just what the INQ Chat 3G can do, then point your browser to T3.com, published by the same people who bring you TechRadar, where they have a video of the phone in action. 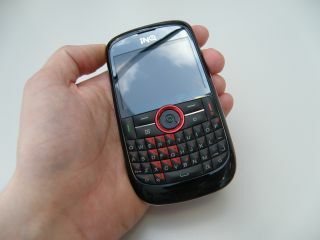 If you want to read about the phone instead, then read our in-depth INQ Chat 3G hands-on review.